IGA, Sobeys Québec’s retail brand, is the largest group of independent grocers in Canada and its presence in Québec dates to 1953. IGA retailers are constantly seeking new ways to serve their customers better. As a Sobeys’ grocery retailer, IGA follows “The Joy of Eating Better” movement, a major directional shift taken by Sobeys Québec in 2014 that is manifested through four pillars: making responsible choices, eating healthier, discovering new local and international flavors, and cooking differently and more often, while never compromising on enjoyment. With more than 280 grocery stores throughout Québec, IGA is constantly looking for new products to offer their clients. When adding a new product, their communications team develops a launch campaign to introduce the new offering to the media and the public. IGA recently partnered with Les Charcutiers Pork Shop, a Montréal start-up company offering artisanal dry sausage. Les Charcutiers Pork Shop is a young, hip company with a strong identity tied to its founders and owners. To promote this partnership, IGA wanted to take a different approach to product launch announcements. 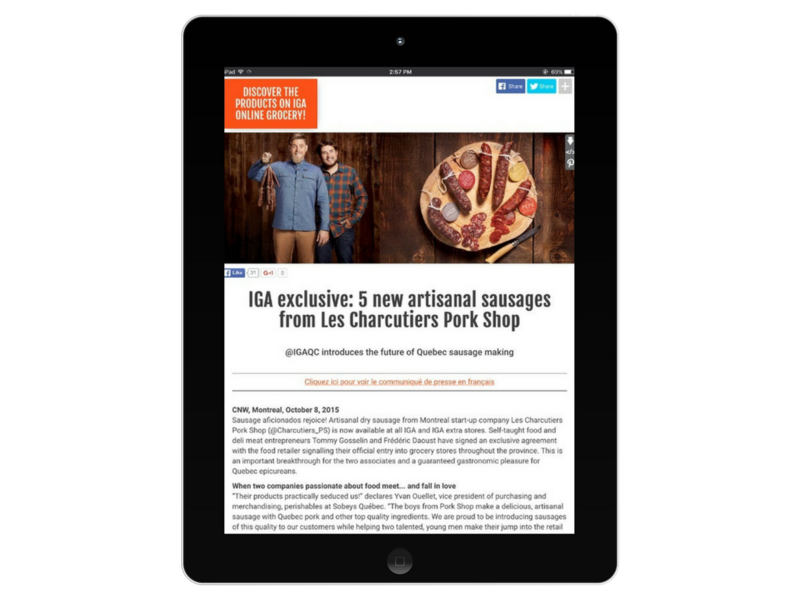 As part of a multichannel campaign, Sobeys Québec worked with Cision Distribution by Canada Newswire, to create a product launch announcement that would stand out from the crowd, convey Les Charcutiers Pork Shop’s identity and IGA’s vision, and increase visibility and awareness for both brands. To achieve this, Sobeys Québec and the Cision team created and distributed a Content Centre, a branded landing page that includes a release, seven photos, call-to-action functions and social sharing options. Les Charcutiers Pork Shop’s identity was built on the authenticity of their young, passionate owners. The Content Centre allowed IGA to convey this identity through the use of bold visual elements and playing on the originality that is important to both of the brands. The ability to add interactive calls-to-action to the Content Centre was extremely useful to the IGA team. As the first grocery store in Québec to provide an online grocery, IGA included a call-to-action button at the top of the Content Centre, which provides readers the option to order products directly from the online grocery store. They also benefitted from the option of embedding various social channels directly on the branded Content Centre page. “The fact that we can include our live Twitter feed on the page, as well as social sharing options, and a call-to-action to drive shoppers to our online store really allowed us to keep the page fresh and have all the necessary information on one platform to showcase our brand,” said Fossat. Additionally, the Content Centre acted as a digital media kit to inform journalists, bloggers, partners and industry influencers of the launch. IGA created a targeted email campaign that included a screenshot of the Content Centre with a quick teaser to drive readers to the page where they could access all the relevant information in one space and easily download what they need. Les Charcutiers Pork Shop’s market is in Montréal. After partnering with IGA and sharing the product launch announcement, there is now awareness of their brand and the wider availability of their artisanal products across Quebec –and Canada. When Les Charcutiers Pork Shop is mentioned in social media, the brand receives a lot of positive feedback, showing that the brand is appreciated by their targeted audience. The Content Centre has simplified media outreach and follow-up. “When we receive requests from journalists about the new product, it is much easier and quicker to direct them to the Content Centre instead of having to find and send large documents that may not transfer via email due to size restrictions,” said Fossat.